A Slimline Sterling Silver band, with a dazzling faux diamond. 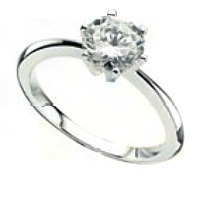 Looks exactly like the classic engagement ring available at all the High Street jewellers. Guaranteed to make any girl's heart flip. We find lots of guys like to buy this to propose with 'cos it looks fabulous. But it also allows both partners to go out shopping together at a later date to choose the real engagement ring. 925 Sterling Silver.